A liquid fertiliser comprising potassium and thiosulphate sulphur, recommended for vegetables, fruits, vines, flowers, turf and ornamentals. 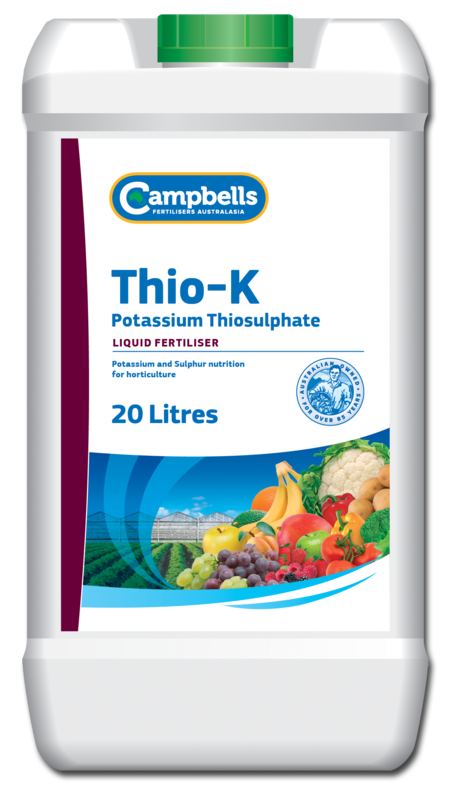 Campbells Thio-K liquid is a chloride free fertiliser containing two essential elements for your crops development, providing immediately available potassium and sulphur. Thio-K is a readily available fertiliser form of potassium and sulphur, which has no negative effects on the soil. As a nitrogen free fertiliser, Thio-K is a preferred source of potassium and sulphur when nitrogen should be limited. Campbells Thio-K is suitable for application via irrigation systems and and ground application. It is an ideal potassium source during later growth stages of fruit and vegetables where the demand for potassium and sulphur may be high, but where nitrogen nutrition is being kept to a minimum. Campbells Thio-K also helps with improving fruit and vegetable size, sugar and colour development and for assuring strong flower development of fruit trees and ornamentals. General fertigation rates for horticultural crops are between 25 to 70 L/ha. When applying Thio-K through the irrigation system more frequent and smaller applications guarantee the nutrients are supplied to the plants without being lost due leaching or excessive rainfall. The actual rates, number of applications and their timing will vary considerably for different crops and for different districts. Before application, seek advice from your Campbells Thio-K distributor or your local agronomist.